Luxury Frontiers, a leader in conceiving, designing and developing luxury tented suites and creative tree-top experiences, has announced a partnership with award-winning Nayara Hotels to create Nayara Tented Resort comprised of 24 tents, each featuring a master suite with en-suite bathroom as well as an adjoining tent that can be arranged as a lounge or a second bedroom. Opening in the first quarter of 2017, each tent will be 945 sq. ft, and will sit on its own platform furnished with an outdoor living area and a plunge pool filled from nearby hot springs. This first foray into The Americas for Luxury Frontiers underscores the company’s expertise with these exclusive offerings for hotel owners and operators who want to capitalize on available land. The brand’s holistic one-stop experiential design, development and operations expertise coupled with investment capital makes its business model especially unique. “In addition to their already successful properties Arenal Nayara and Nayara Springs, the development of this new resort gives Nayara Hotels an alternative, ‘light-on-earth’ solution to using existing land to create an amazing, immersive experience for their guests,” said Luca Franco, Founder and Managing Partner, Luxury Frontiers. Differentiating the brand even further, Luxury Frontiers accommodations are eco-friendly with sustainable design features, ranging from the use of locally and sustainably sourced building materials and aerobic sewerage treatment systems to rainwater capture systems and renewable energy sources. Luxury Frontiers has completed five projects including tented accommodations for Lemala Kuria Hills by Tourvest in Tanzania, Musangu Lodge in Zambia and the Shakawe River Lodge in Botswana as well as a resort add-on for the Gran Hotel Son Net in Mallorca, Spain and a full refurbishment of the Belmond Eagle Island Lodge in Botswana. Projects in the pipeline include major partnerships with globally renowned luxury hospitality brands including Four Seasons, Six Senses, Wilderness Safaris and more in locations across the U.S., Colombia, Tanzania and Botswana. 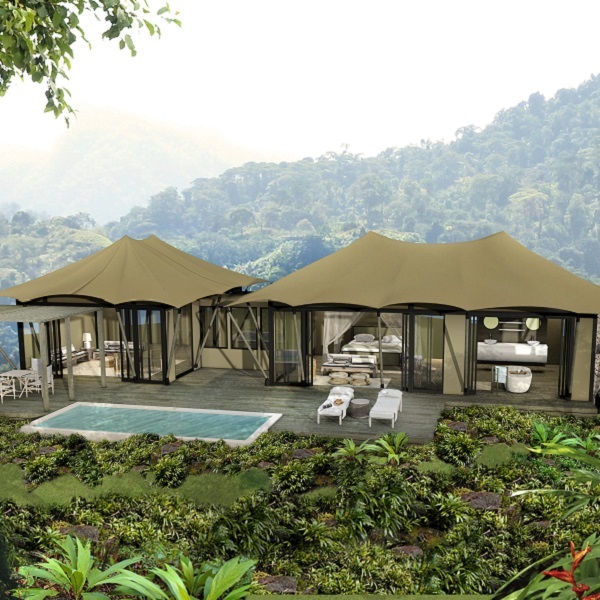 Luxury Frontiers is a market leader in conceiving, designing and developing luxury tented suites and creative tree-top experiences for the global traveler. The accommodations are created to the highest standards and are designed and operated to provide exciting, authentic and memorable experiences without compromising guest expectations for luxury comfort and quality. With a combined experience of more than 80 years, Luxury Frontiers’ highly skilled leadership team has deep experience in the African safari camp business and has worked with leading luxury hospitality brands such as Four Seasons, Ritz Carlton, Abercrombie & Kent, Six Senses, Belmond, Wilderness Safaris, Explora and Aman. For more information, please visit www.luxury-frontiers.com.